More soup! 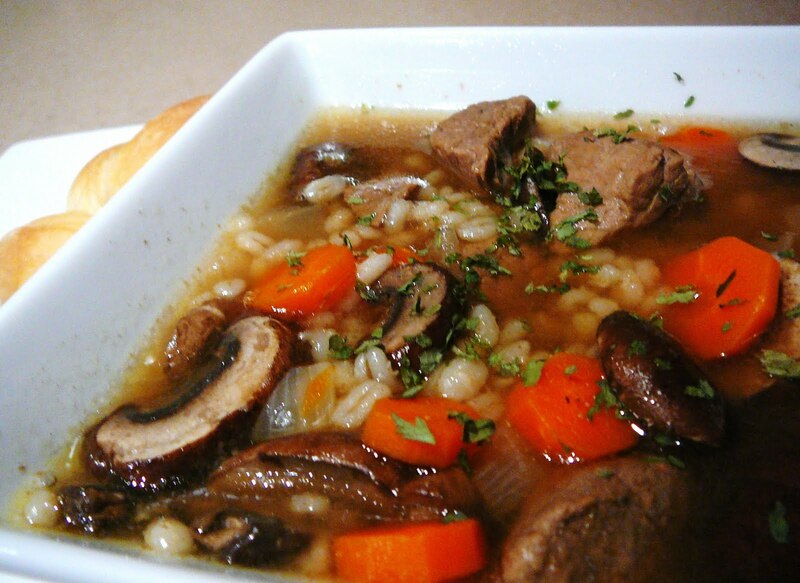 This brothy dish is great for a chilly fall evening. Better yet-- very little prep is involved. In a large non-stick skillet on medium-high heat, brown stew meat (do not cook through). Add meat to a large soup pot with water and beef bouillon. Bring water to a low boil, then reduce to simmer. In skillet, add onion and carrots. Saute until onion becomes tender, ~5 minutes. Add carrots and onion to soup pot. Stir in garlic powder, salt, and pepper (to taste). Simmer soup for ~2 hours. Add barley and mushrooms and continue to simmer for 1 hour. Garnish with parsley and serve! This is one of my favorite soups. I love freezing it for quick dinners.